You won’t miss the added sugar that often pops up in breakfast drinks with this Mediterranean-flavored smoothie bowl. The magical combo of pomegranate and cherry—along with a dash of cinnamon—provides all the natural sweetness you’ll need in this creamy, frosty smoothie that’s so thick, you can eat it with a spoon. Put the cherries, yogurt, pomegranate juice, milk, vanilla, cinnamon, and ice cubes in a blender. Purée until thoroughly mixed and smooth. You’ll want the mixture a little thicker than your average smoothie, but not so thick you can’t pour it. If the smoothie is too thick, add another few tablespoons of milk; if it’s too thin, add another few tablespoons of yogurt. Pour the smoothie into four bowls. 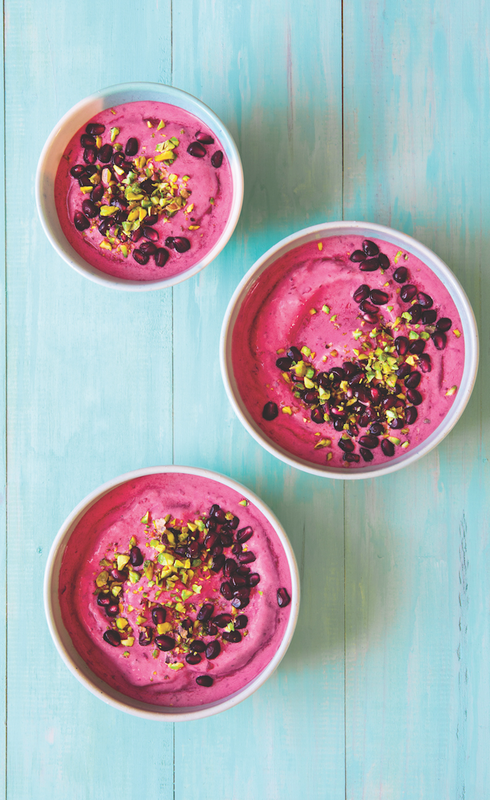 Top each with 2 tablespoons of pistachios and 2 tablespoons of pomegranate seeds, and serve immediately. Ingredient tip: You can buy packaged pomegranate seeds—also called arils—in the refrigerated produce section of your supermarket, but we’d also encourage you to try buying the whole fruit when they’re in season. To avoid stains from pomegranate juice, try our trick of removing the seeds under water: Fill a large bowl with water, submerge the pomegranate, and cut into four sections. Working under the water, remove the seeds from the white membranes. The seeds will float to the top, and you can remove them with a strainer or slotted spoon.